South Australia’s last coal-fired power station is under demolition. Explosives were used to demolish the Port Augusta’s 47-metre-high east coal bunker and towers. Last month, the station’s west coal bunker and tower were blown up. The Northern Power Station, 280 kilometres north of Adelaide, was closed by its operator Alinta Energy in 2015 after an unsuccessful attempt to gain $25 million in subsidies from the South Australian government. Flinders Power, which is decommissioning the site, said the power station’s iconic 200-metre-high northern stack is scheduled to complete the demolition in July this year. When demolitions conclude in July, South Australia will no longer produce coal-powered electricity, marking a step forward in line with the state government’s plan for clean energy. 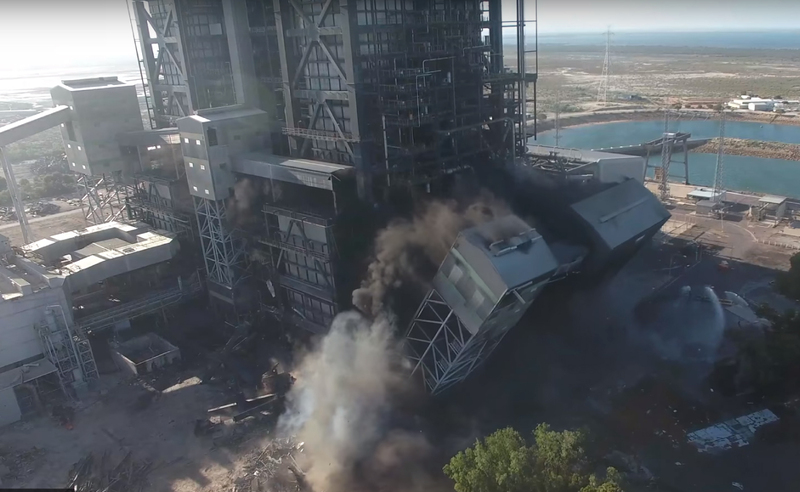 The Port Augusta demolition comes after a number of other coal power stations were destroyed across the state, including the 80-metre-high chimney stack at Playford B in January. Clean-up of the decommissioned power plant has created dust issues for Port Augusta residents. Following the closure of the Port Augusta power plant in 2015, 185 jobs were lost for the local area, and power prices immediately spiked and was trailed by a period of blackouts. South Australia Premier Jay Weatherill announced a $550 million energy plan that includes Australia’s biggest battery storage system. The South Australian government has also commissioned Aurora, a $650 million solar thermal power plant designed to satisfy the state government’s power needs. The aim of this project is to reduce energy price volatility for households. South Australia has become a global leader in renewable energy with one in four houses fitted with solar panels. There are also plans for 15 new wind generation projects across the state which is set to double the number of wind farms in South Australia.